About 18 months ago I set up an Instagram account for Flash, because I was getting told by some friends that there were too many dog pictures on my instagram account. Now 1. they are mental - too many dog pictures? Never. And 2. Can someone please suggest the same to the people who post incessantly about their kids? Is that allowed? Because Puppies > Kids. No question. So, with this in mind I figured that I'd set up a separate account for him and they could choose not to follow it, and this meant I could also post as many puppy photos as I wanted without any fear I was posting 'too many'. 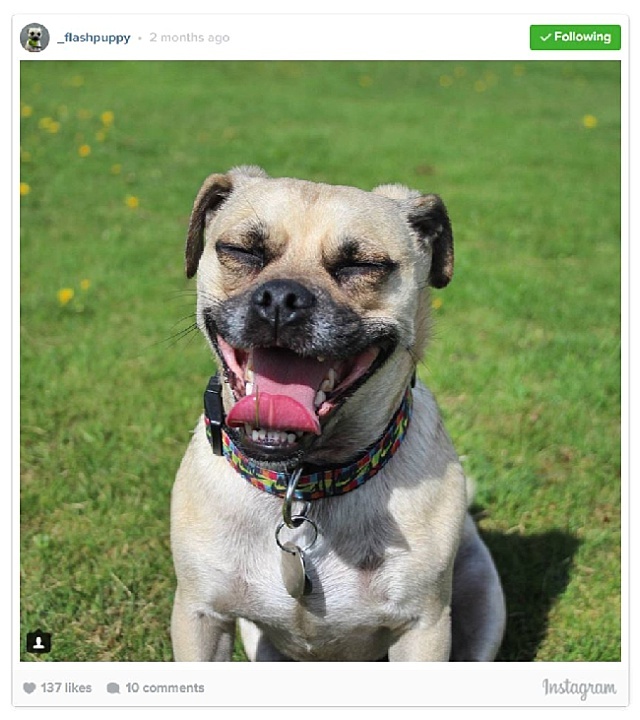 But I wasn't prepared for the wonderful community that comes with having a 'Dogstagram' account. I started off by following the dog accounts, and other Jug owners, that had followed my personal instagram account and only really liked my dog photos, and then started searching through their followers for other pup accounts to follow, commenting as we went, making friends with other similar accounts who were as crazy as us to have a dog instagram account. Now, 18 months on, we've built up a wonderful community of followers and made some wonderful 'friends', people who post about their dogs, who regularly comment on our posts, and accounts we've followed for so long we know them well. And the support that comes from Dogstagram is wonderful. When we first got Melle, and he and Flash weren't getting on, I turned to Instagram for help and we were overwhelmed with responses of things we could try to help them get along. When one of them has an upset tummy, or an injury, posting about it (post vets if needs be) gives you reassurance that their dogs have done the same and they'll give you a remedy that helped, or you get tips on how to keep a 4 month old puppy from running about. One of the accounts we've known for as long as we've had Flash is an account for a couple of Jug dogs in Canada, Shemy & Hiro, with whome, for the last few years we've exchanged Christmas gifts - this year they even donated to their local dog centre in our name. We've joined in with dog secret santas, There are great #'s that people join in with like #tongueouttuesday, there are accounts that tag their 'pawtners' (essentally other accounts they like) there are follower competitons to win treats and toys. And best of all, we've got 'friends' in Australia who DM us with training tips, we exchange sarcastic comments with Pugs in Germany, we've got Jug friends as close as the next town over or ones based in New York. We've watched spaniels grow from puppyhood and become Instafamous. We've had comments and follows and then conversations that have lead to people getting a Jug themselves. And whilst I know that these dogstagram friends are people, just like me, pretending to be their dogs on Instagram, there is such a friendly feeling about the place, I regularly find myself spending far more time scrolling through pictures of dogs than I do of people's dinners, their flaylays and the horizon. I know that Dogstagram won't be for everyone, even if they do have a dog, and that there will be a high proportion of people who think I am a bit mental for running this account but it's just so much fun. There is never any agro, and none of the pet accounts we follow take themselves too seriously (some do, but I have no time for them at all) and it's suprising how many 'human' accounts follow and comment on the dog accounts we follow. People love puppies! Are you a Petstagrammer? Do you think I'm totally crazy? If not, who are your must follow accounts?